The Commander is still one of the best dual purpose UTVs on the market, and with a powerful 976cc engine it is powerful enough to play in the mud, tear up the dunes, or take on anything else that you have to throw at it. Of course, there is always the issue of ground clearance depending on the type of driving you do the most. Plenty of owners opt for simple 2-3” bracket lifts for some bigger tires, but if you do serious riding, you may need a foot or more of additional clearance and the kind of heavy duty components that such a lift requires. The following are a few of the more aggressive lifts that have proven high quality and reliable for years. 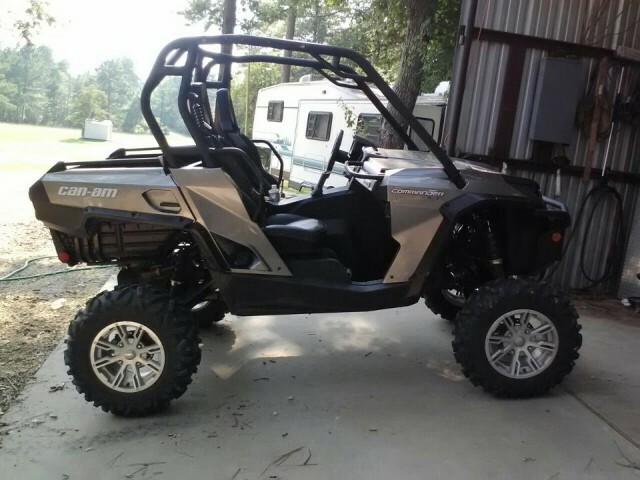 SuperATVs 6” Can Am Commander lift is an excellent value at just $1599.95, and includes high clearance, heavy duty a-arms, tie rods and Rhino Brand axles. The “Wicked 6 Series” kit uses 1.5” forward offset a-arms, and 4” rear offset trailing arms for nearly 6 inches of length increase as well. The kit also includes the Commander’s width a staggering 5” per side for excellent stability. The kit adds 6” of additional ground clearance with stock tires, but can accomodate up to 36” tires! Fully adjustable pivot points and pre-installed front ball joints are also included, as is all of the necessary hardware for installation. SuperATV also warranties the A-arms for life and the Rhino axles for a year. The set-up utilizes the stock rear torsion bar assembly to retain excellent handling characteristics. LSR has been racing UTVs longer than anyone, and they have taken their experience to build their XTR + 6 long travel kit for the Commander. The XTR suspension kit is 6″ wider per side Than stock and includes +2″ longer rear trailing arm. All a-arms are made with heavy duty 4130 chromoly for added strength. The XTR +6 long travel shock is included for better ride quality and an incredible 16″ of wheel travel. This kit carries a full lifetime warranty on both the arms and the axles. The kit reuses the OEM pivot bearings and ball joints, and the mounts for the rear sway bar as well. They do not allow use of the front swaybar on the X version. The XTR kit also Includes extended axles for longer travel suspension. For these and other high quality lift kits for the Commander, visit www.sbsparts.com.